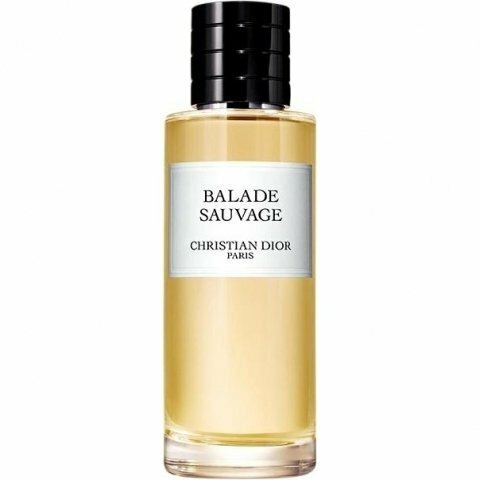 Balade Sauvage is a popular perfume by Dior / Christian Dior for women and men and was released in 2017. The scent is fresh-citrusy. It is being marketed by LVMH. The scent is part of the collection "Maison Christian Dior". Balade Sauvage is on the new cuddle skirt! No it is not cuddly, but the comparison with cuddly skirt (is there still?) I would like to draw nevertheless. On the albums there were usually beautiful songs, but you had already heard them all year long, some of them really noodled. But it was handy to have them all on one CD so you don't have to change them all the time. So or so it is with Balade Sauvage, a collection of beautiful smells, which one knows however so already all, at least if one is friend of citric, ethereal smells. The greeting from the kitchen is Petit Matin, tender, tangy fresh lemons with a green-vegetal touch, not particularly sour or tangy, rather shy in the morning, tender, slightly creamy. A sweet and salty fig is quickly served as a second course, strongly reminiscent of Figuier Ardent by Atelier Cologne. Very ethereally fresh, like a single fig tree on a Mediterranean headland by the sea, rarely smelled such a pleasant fig, often it gets on my nerves quickly, especially when it gets too sweet. Often she moves too much into focus, occupies you, so that you don't notice other, fine facets of the fragrance anymore, Ferragamo's classic is a good example. So it needs an opponent, here it would be the citric and flowery nuances, they can't compete with the fig, but by the slightly woody undertone, it is kept in check. Similar fragrances such as Fico di Amalfi and Cedro di Taormina are partially incorporated here. The sweetness in the background reminds me of ELDO's Remarkable People, it makes the whole thing a bit creamy and provides a further counterweight. Unfortunately I couldn't find out who caused it. All this together really smells very pleasant, but just not new. It doesn't have to be, it also appeals to me, because it's so easy to wear without being a soliflore, which can quickly be monotonous and boring. I would also like to keep him happy that the wheel cannot be reinvented in this fragrance segment. All citrus fruits of this world have been pressed out completely in all possible combinations except for the peel and beyond. Atelier Cologne in particular offers a fragrant overview here. What makes the fragrance exciting is its counterpart. Just Aqua Sextius shows that with his oak moss wonderful. More casual and easier to wear is of course Balade Sauvage. Similar to Paris-Deuville by Chanel, he conveys this light-heartedness, even a piece of purity, a high degree of being cared for. So I guess they'll both have to fight for my favor next spring. In my ready-made sympathy for the Dior Prive series, I already have a hunch who will make the game. Even if he can't compete with the big scents of the Prive series, like Gris Montaigne, Bois d'Argent or Mitzah, and I don't like basic brands and doubt their inspiration, which bring out 5 scents at the same time or 10 scents in 2 years, I still like him as a perfect all-rounder, as a wonderful day scent in warm temperatures, in winter he will go down mercilessly. Here we would be already with his big deficiency, his durability. If I want to express it benevolently, he remains loyal to me for 3 hours rounded up, there would be like then again on Acqua di Parma level. The Sillage is really good in the first hours, there is a really good surge of good mood and fresh showers, but unfortunately it retreats too fast for me, too bad. Here then the 125ml should fit very well. Yes, there are a number of fine fragrances in the Dior-Privée range, most of which are more wintery. "Balade Sauvage", on the other hand, picks up on summer moments and one has to say that Dior has succeeded in creating a fine, quite relaxed, beautiful and gentle refresher. One might well believe that it essentially consists of only the top three components. Remarkable is above all the fig tree as an aroma, which reminds a little of the beautiful men's classic "Dune pour homme", although it is noticeably harsher and woody. Here the unisexhaftigkeit is indeed worked out cleanly, the slightly creamy, Fluffige stands in the center. A little green, garnished with citric sprinkles, lightly mineral in the "sea sense", dominated in the heart primarily by very gentle, harmonious fig, "Balade Sauvage" comes along as a really very exhilarating good mood scent. Thanks to a gentle, subtle acidity, this dior does not become too limp or shallow, but remains pleasantly on the skin for a few hours in summer. Very nice. When I sprayed Balade Sauvage for the first time two days ago, I felt as if I knew the scent from somewhere. This pleasant, light, transparent, elegant sweetness. Like a really nice Iso-E-Super-Blender, but you will unmask it with time. Let's have a look. I don't want to be prejudiced. This elegant sweetness is initially accompanied by beautifully balanced citrus notes. A perfect interplay. Very gentleman-like and natural-looking. And also the ladies should not be held back to try this jewel. Later I am reminded of the "Colonia Intensa" of Acqua di Parma. There's a noticeable higher note. Also here I have a synthetic suspicion, which is still strengthened by the long durability. Balade Sauvage has a maritime attitude to life within it. But the fragrance is also an elegant, tasteful statement that fits very well into the city and the office. And it is a really skillfully composed fragrance, without corners and edges, but nevertheless with character. Anyway, I have nothing to expose at Balade Sauvage. It stays pleasant all day long and spreads a beautiful aura that really lasts for a long time. At the moment my hottest purchase candidate. Write the first Review for Balade Sauvage!